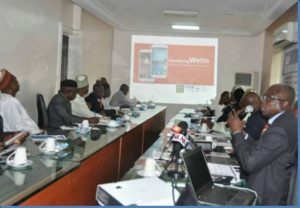 The Nigerian government has launched a new weather app: ‘Wetin App’ to help tame flood problems in the country particularly along the Benue and Niger river basins, the country’s two main rivers where over-flooding has caused loss of lives and extensive damages to farmlands and other properties. In 2012, the floods from the two rivers destroyed farms and rendered millions homeless. The challenges can be addressed with early warnings and quick, rapid responses aided by soft tools such as the ‘Wetin App,’ the Federal Ministry of Agriculture and Rural Development announced recently in Abuja during the formal launch of the mobile application. The app which is available for download on Googleplay Store is a joint project between the Ministry of Agriculture and Rural Development and the International Water Management Institute (IWMI). The Permanent Secretary, Federal Ministry of Agriculture, Dr. Shehu Ahmed, represented by the Director of Agricultural Businesses, Processing and Marketing ,Alh. Azeez M. Olumuyiwasaid Nigeria sought the help of the international agency to develop the mobile application following the destructive flood of 2012 which resulted inthe huge destruction of farms, houses and human lives.